What can I do if the installer doesn't start on my computer? How do I get and install my purchased license? What can I do if my MCP is not found? 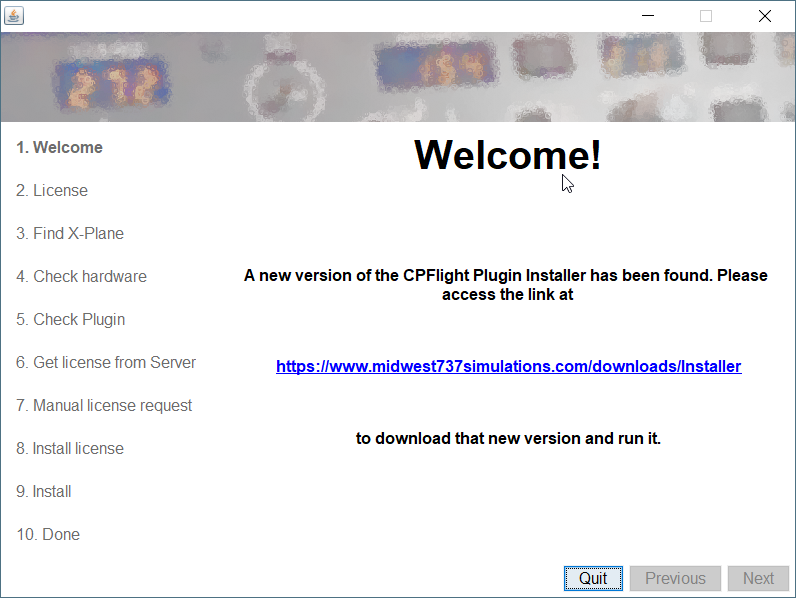 Please uninstall any existing CPFlight plugin and terminate any CPFlight test software before running the installer, as it would interfere with the installation process. 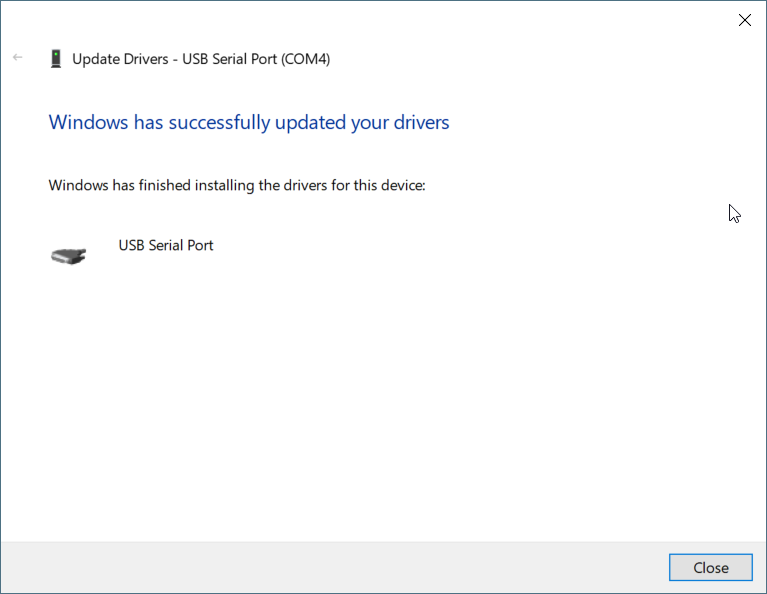 As long as another software occupies the COM port, the Installer is unable to identify the MCP. The installer comes as an executable JAR file. There's no need to unpack the downloaded .jar file. If you have Java installed, it should run by clicking on it. On OSX, Java requires programs to be signed, but it tells you what to do to run an unsigned JAR file. We've had a very small number of bug reports that the installer doesn't open when clicking on it or only briefly shows the startup screen and then closes down automatically. Until now, we weren't able to fully trace down the problem, but the customers reported that the problem went away when the installer was started with administrative privileges from the command line. Check this video to see how to run a downloaded java file from the command line. Please mail us at support@midwest737simulations.com if you encounter this or similar problems. Upon start, the installer automatically verifies its version and asks you to download a new version if yours is outdated. It then guides you through the sequence of screens that install the plugin and the associated license. The first step is to purchase a version on the web store. If you are a first time customer, you will have to create a user name (which is your email address) and password. Remember these well, because you will use them later in the installer to retrieve you license. After completing the payment, rerun the installer. The remaining procedure depends on whether the installer finds a valid or invalid demo license on your computer. The installer will offer you to install a demo license. Click on "Retrieve purchased license". You'll see a screen asking for your web store credentials: user name (which is your email address) and password. Please type them exactly as you did on your purchase on the web store. If you don't remember, click on "Open Web Store" and reset your password. The installer will state the fact that you have a valid license. Click the option "Request a new or existing license". The installer will show a list of options which contains the demo license. Make sure to choose "Retrieve purchased license". The installer asks you if you want to overwrite your current valid license. Confirm. 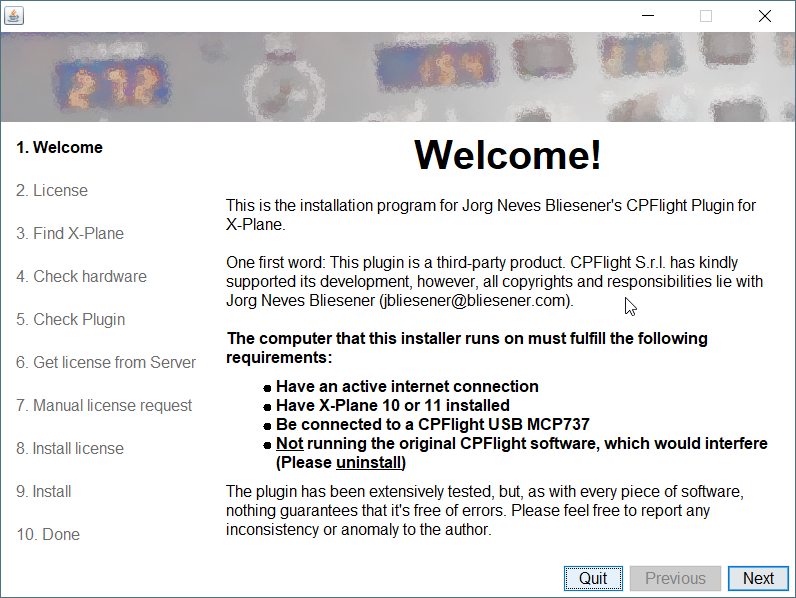 The installer will scan for valid licenses on the server and show them in a list. Select the one you purchased and continue. 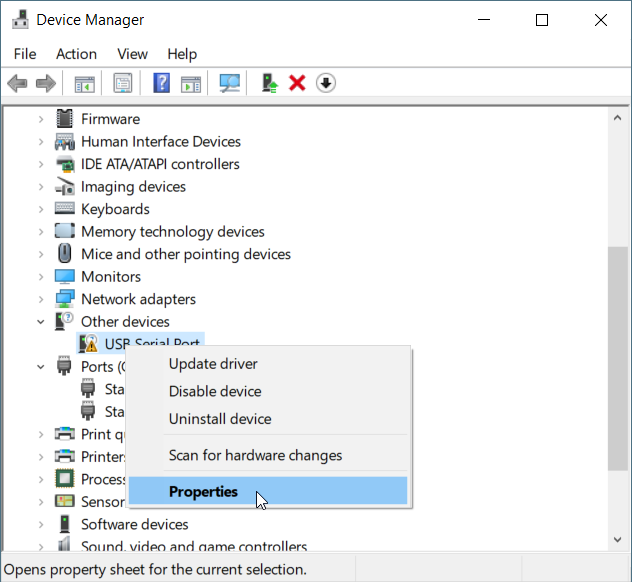 Problem: The MCP is not connected to your computer or your network. Solution: Connect the MCP and make sure it's turned on. 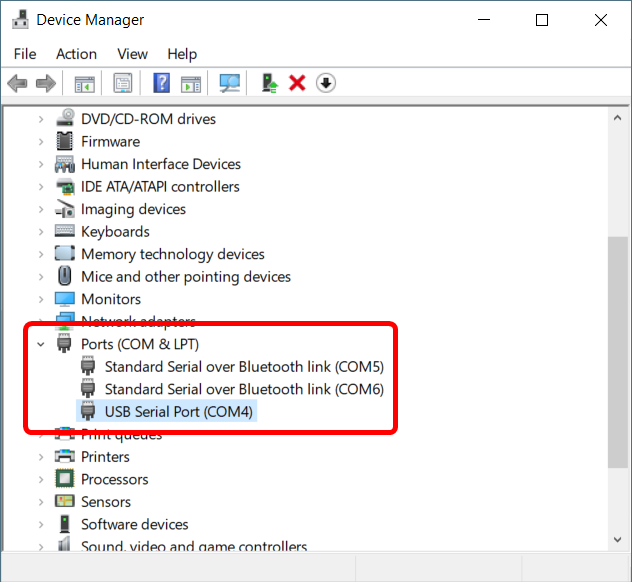 Problem: You're trying to connect a CPFlight USB MCP on Windows and you don't have the standard serial driver installed. This is a Windows installation problem that should not happen, but we have received reports that it sometimes does occur. If so, right-click on it, and then select "Properties...". 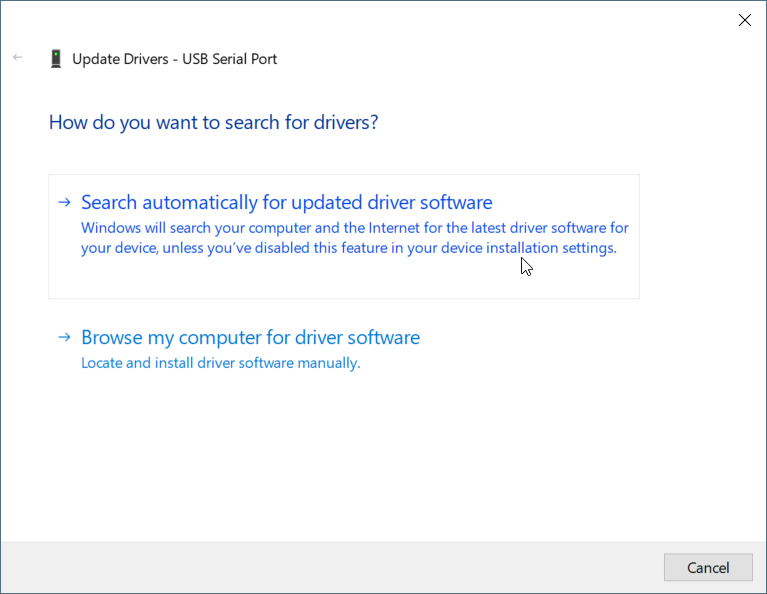 Click on the "Driver" tab and then on "Update driver". 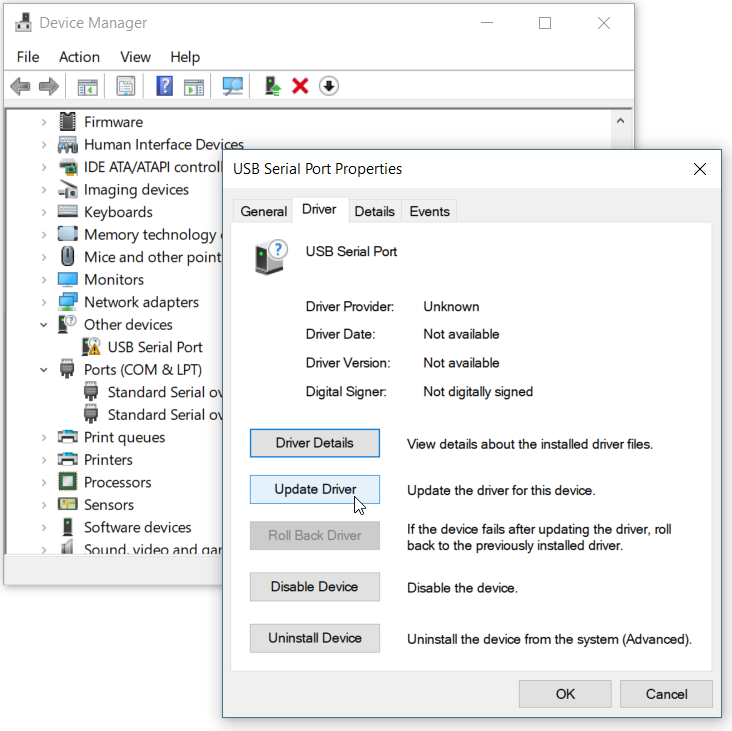 On the next screen, select "Search automatically for updated driver software"
This should automatically install the standard Windows USB COM port driver. 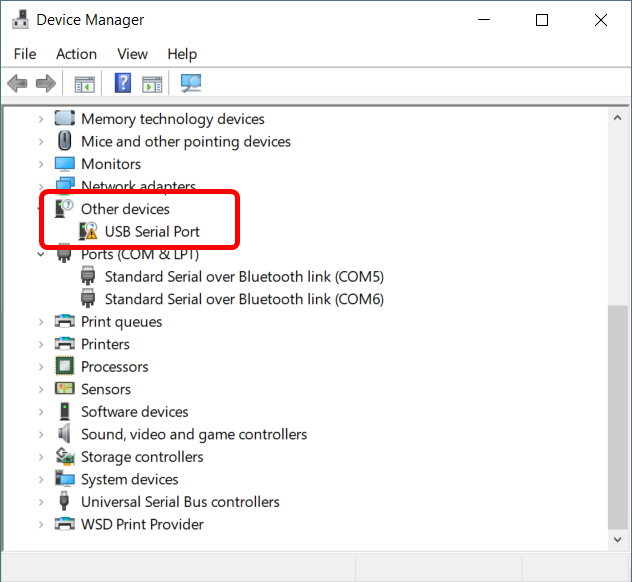 Solution: In contrast to the USB models, Ethernet MCPs can not be identified automatically. You need to manually configure an IP address on the MCP. This IP address must be reachable from your computer and no other device in your network may use the same address. Then you must set the same address in the installer software. There's a button called "I have an Ethernet MCP" on the "Check hardware" screen that guides you through the process. If none of these suggestions resolve your problem, please write us at support@midwest737simulations.com and we'll do our best to find out what's going on. For example, we've had isolated cases where the MCP lost its serial number and therefore was not recognized by the installer. This is a very uncommon case, where the MCP actually worked with a different software that didn't query the serial number. Every MCP is entitled for a free 14 day demo license. After that period, running the plugin requires a valid purchased license. The license is tied to the MCP and can be transferred to another user without cost. In order for the new user to be able to request copies of the license, he or she should get in touch with us and require a license transfer in the web store. Furthermore, a license for the same MCP can be used on up to five computers. If you reinstalled you computer from scratch, please rerun the installer and it will be included in the list of authorized computers. If you require a license to work on more than five different computer ids, please get in touch with us. From this information, only the CPFlight MCP serial number and the computer ID are effectively used for the issued license. The remaining items are debug data used exclusively to identify possible problems during the installation process.